Concrete has been cut around the world, but never to the scale or complexity required for the development of the Zeitz Museum of Contemporary Art Africa (Zeitz MOCAA) being constructed at the V&A Waterfront’s Silo District in Cape Town, Western Cape. The historic Grain Silo complex, which is almost a 100 years old, is heritage listed and the decision was made to repurpose the complex of 42 concrete silo tubes and elevator building to house the Zeitz MOCAA. This project challenges the construction norm in that this is the first time extensive curved concrete work has been tackled concurrently with top-down and bottom-up demolition activities. By the time the Zeitz MOCAA is completed early next year the main building contractor, WBHO, will have cut almost 60 kilometres of concrete to execute architect, Heatherwick Studio’s unique vision for the project. In executing Heatherwick’s design, the concrete grain silos have gradually been carved away to create the new museum space and the impressive atrium of the structure which resembles a large grain of corn. Mark Noble, senior development manager for the developer V&A Waterfront, tells Concrete Trends that the design of the atrium connects the new building to its historical grain storage legacy. “The atrium has an organic irregular shape because its design is derived from the natural shape of the corn kernel. The architects digitally scanned a piece of corn grain three-dimensionally and then supersized it to form the space,” he says. In order to execute this unique design, WBHO sculptured out underneath four of these bins on the west side of the structure and expanded out to the east side of the adjacent former elevator building, forming the large irregular cut-out oval shape. To create the museum gallery, the edges of the bins around the structure have been left intact, while some of the inner 33 metre (m) by 5,5 m silos have almost been completely removed. Noble says that, along with the engineering aspect of the structure, one of the biggest challenges was how to remove portions of the silos without affecting the strength of the 100 year old structure during the construction period. Many of the silo tubes were actually split or cracked right around horizontally and standing on their own self weight. These cracks and damage were a result of overloading the grain silos during use in an attempt to force out blockages in the bins. This meant that these particular siloes needed to be structurally reinforced. “To strengthen the external elevation of the building, the inner face had to be lightly cleaned whereafter chemical anchors were fixed in place and reinforced, and then insulation foam applied. Only then was conventional reinforcing installed and work could start on the curved shutters,” Ben Coster, operations director for the project manager MACE, explains. Resleeving the bins on the outer part of the building relied upon a bespoke shuttering system that could be adapted to suit the unique shape and curvature of each silo bin. The varying shapes of the bins were as a result of being originally constructed by hand. Once this had been successfully completed, a large section could be demolished on the east side of the structure where the new galleries are positioned. Special shuttering based on the shape of the expanded grain had to be designed to assist in forming the cut-out on the west side of the silos where the atrium was to be cast. This allowed for an oval shape to be cut out of the tube and an angle to be formed on the side that varied from 90 degrees to about minus 5 degrees. Coster explains that this would allow the reshape of the atrium to be carved through at a later date. Having sufficiently strengthened the silos around the edge of the atrium, WBHO could raise the lining of the silo tubes to meet what is set to become the sculpture garden on top of the structure. At this stage, work also started on connecting the new concrete with the old concrete to create an arch to lock all the silos in a rigid form, ensuring structural integrity. When the new concrete arch reached the halfway mark, the professional team worked with the temporary works engineer to find ways to remove segments of the atrium without compromising the structural integrity of the historical silos. Adopting this approach gave WBHO a significant head start ahead of the main cutting and demolition activities once the arch had been completed. Concrete was cut using diamond wire and large grinding saws, some with blades of up to 2,5 m in diameter. Extensive use was made of a double-cut saw with two blades allowing a curve to be cut through the concrete. With the angles of the cast oval shapes being used as a guide. When commencing work on the atrium, the professional team designed four specialised hanging scaffolds that were mounted internally at the top of the silo bins and hung down about 18 m. This allowed WBHO to continue cutting the curve and sections of the existing silo tube into blocks of about one square metre in size and drop them into the bin. Once demolition had descended down to about 18 m, WBHO then had sufficient reach with a 20 ton excavator to continue the demolition and were able to drag the blocks out at the bottom of the bin, and continue to cut the balance of the atrium. This is followed by extensive refining and shaping of the atrium to achieve Heatherwick Studio’s vision of a seamless curve. This has required extensive training of the local artisans by Thomas Heatherwick to raise their skills levels in this extremely “interactive” process. “They have not only had to improve their grinding skills on a flat surface, but also on an angle and curve while inverted. The only way to do this is a combination of standing back to strike an accurate line that then needs to be ground and polished. Heatherwick personally spent hours with the grinding teams showing them how to use the palm of their hands to actually feel for indentations, as well as high and low points on the concrete surface,” Coster says. The elevator building forms part of atrium, and a transfer beam had to be formed on the sixth level of the east side of this structure. Doing this allowed the removal of a large portion of the east side of the elevator building to form the complete arch of this irregular shape. The existing steel frame inside the arch has been left as temporary work and will provide protection against ground vibrations while demolition activities are underway. Once completed, the steel frame will be cut and the arch released in its entirety. It is a three-dimensional arch that runs from the outer elevation and curves into the building as well. Leading building materials supplier, AfriSam, is supplying all the new concrete requirements for this project. This includes the special design mixes that are being used in shallow shutters to restore the external aesthetics of the bins – in line with Heatherwick Studio’s vision to celebrate the industrial heritage of the structure. The old magnolia painted render from the outside of the building was chipped away by hand and air tools. Surfaces were then cleaned with high-pressure water sprayers to remove the loose elements of concrete in fragile areas. Areas where silo bins have suffered from age and some oxidisation of existing reinforcing material was then cut back and treated. Importantly, old concrete from the structure and reinforcing bar is being recycled into saleable products. It is also apt that some of the original off-grey, “yellowed” concrete is being retained at the Zeitz MOCAA museum. This is considering that this build can be viewed as more than a celebration of South Africa’s industrial past. For concrete technologists and other built environment specialists, it will also serve as a monument of the concrete legacy the country has built over the years. AfriSam, as the leading concrete materials producer in the Western Cape, has nurtured a strong business relationship with WBHO over the years, and was instrumental in providing speciality mix designs that would meet the exacting nature of the concrete construction requirements of the project. 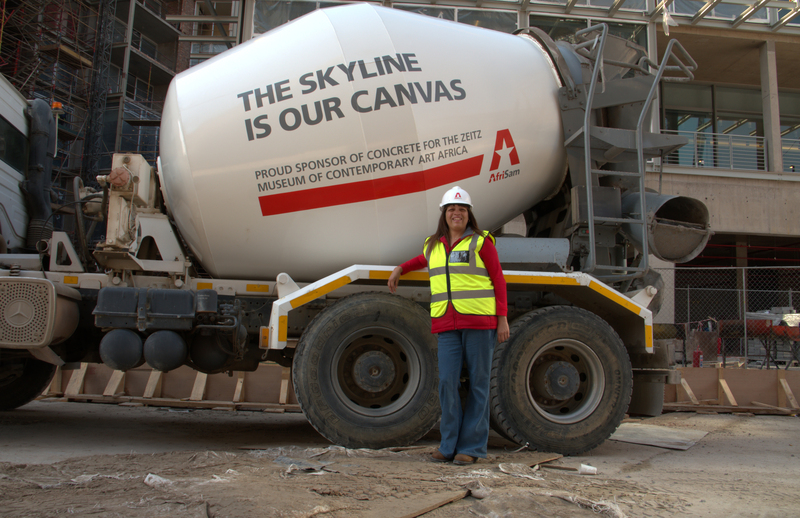 Melanie Ross, territory manager of AfriSam, says the contractor has always appreciated the company’s in-depth knowledge of construction materials that allows it to apply the correct readymix concrete products for a given application. This is complemented by its access to consistent quality raw material that is used in the concrete batching processes. While AfriSam supplied some standard concrete mixes to the Grain Silo project, the main mix for the silos including the sleeves was a prescribed mix of 30 MPA with a 9 mm stone. This mix was developed over a period of testing to ensure that it would have the correct consistency. Aggregates were an important factor in the final mix design as the surface finish had to meet the stringent specifications of the architect but also had to comply with the workability requirements. Each daily pour was slow discharge because of the workability and the way the formwork was positioned inside the silos. On average there were two daily pours of 4 m3 each and discharge time was 2 hours. Traditionally, readymix offloading should take anything from 45 to60 minutes, however in this instance the offloading time was extended to accommodate the complexity of pouring into the complex formwork in the silos. “This is an example of AfriSam’s flexibility in meeting specific customer requirements,” Ross concludes.